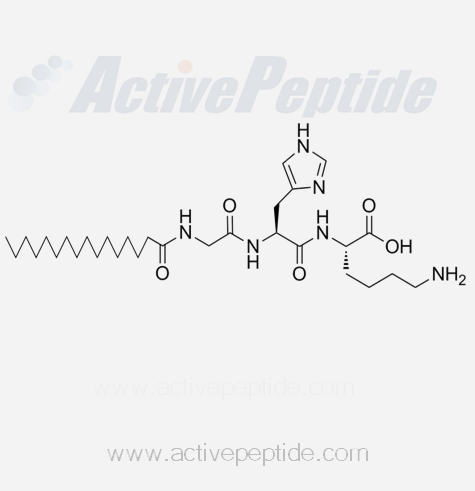 Our scientists produce this peptide from a world-class laboratory. We provide USA-based shipping, customer services and technical support. We run a price match program to ensure a very competitive price. 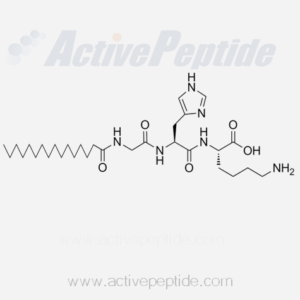 Contact us for COA, MSDS and Tech Data Sheet..
Package and Analysis Example Request a Quote for Palmitoyl Tripeptide-1 to receive a prompt response and the best price from Active Peptide Company. Cat No. AP103005. Other Names: Pal-GHK; Gly-His-Lys, Palmitoyl Oligopeptide Applications and Properties: Pal-GHK is a version of GHK designed for better skin penetration, intended to stimulate collagen and skin matrix replenishment via topical application, leading to wrinkle reduction, skin firming, skin roughness improvement and other benefits. This product is pure powder with purity >98%. No excipients, preservatives, anti-oxidants present, or used during the manufacturing process. It is 100% synthesized in laboratory so not involved with plant, vegetable, or marine. It is neither palm derived nor sustainably sourced.